Bulgarian Christian Orthodox honor Saturday the All Souls' Day before Pentecost or the so-called Cherry All Souls' Day. All Souls' Day is also known as the Feast of All Souls, Commemoration of all the Faithful Departed. 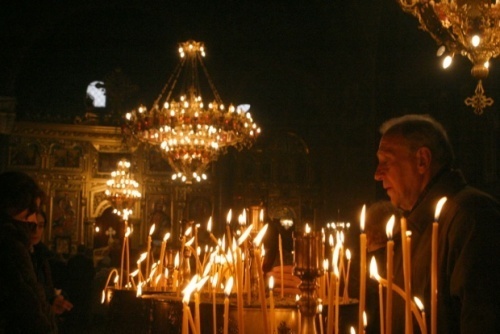 The Eastern Orthodox Church dedicates several days throughout the year to the dead, mostly on Saturdays, because of Jesus' resting in the tomb on Saturday with the All Souls' Day before Pentecost having a special significance. Pentecost is one of the prominent feasts in the Christian liturgical year. The feast is also called Whitsun, Whitsunday, Whit Sunday, Whitsuntide. Pentecost is celebrated seven weeks or 49 days after Easter Sunday, hence its name. Pentecost falls on the tenth day after Ascension Thursday. Historically and symbolically Pentecost is related to the Jewish harvest festival of Shavuot, which commemorates God giving the Ten Commandments at Mount Sinai fifty days after the Exodus, Pentecost now also commemorates the descent of the Holy Spirit upon the Apostles and other followers of Jesus. According to the Bulgarian tradition, women boil and sweeten grain to take to the services and hand it to other attendees. The tradition also includes wine and bread while in recent times cookies, crackers and pastries have been added. The services are held at the cemetery, the church or at home. At the cemetery the priest usually performs the Parastas (Panikhida) - a liturgical observance in honor of the departed which is served in the Eastern Orthodox Church. If the service is for an individual, it will often take place at their graveside. If it is a general commemoration of all the departed, or if the individual's grave is not close by, the service will take place in a church, in front of a special "memorial table". According to Orthodox beliefs, the Souls of the Departed come back on this day and stand at their own graveside. For this reason their relatives bring them wine and food. The ritual giving away of food to other people is believed to help satiate the Departed's hunger. The relatives also light a candle to illuminate the Departed's road so that they do not get lost in the dark. The All Souls' Day before Pentecost is known in Bulgaria as the Cherry All Souls' Day because cherries are the most popular fruit of the season, present on the table at all feasts.